The North Canadian River—a key component of Oklahoma City’s watershed—runs 441 miles from New Mexico to Central Oklahoma, where it joins the Canadian River and Lake Eufaula. 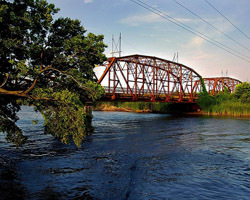 Oklahoma City channels much of the river water into reservoir lakes, including Hefner and Overholser, which together with the other regional lakes, supply drinking water to the city and surrounding neighborhoods. The lakes are also stocked with popular fish, and residents use the lakes and river for recreational boating and rowing. Like most metropolitan rivers, the North Canadian is highly engineered, its levels controlled according to various demands, including water treatment, recreation, and maintenance of drinking water supplies. Both Lake Hefner and Lake Overholser have a long history of eutrophication, a harmful condition characterized by lack of oxygen, resulting in excessive algal growth and death of aquatic life. Eutrophic conditions are caused by nutrient-rich runoff from point sources (such as factories and sewage treatment plants) and non-point sources (such as stormwater carrying oil, animal waste, and other pollutants from streets and rooftops, as well as pesticides and fertilizers from fields). Eutrophic conditions stimulate the growth of blue-green algae and the production of cyanotoxins, which can cause health effects ranging from dermatitis to cellular damage and neurotoxic effects. Oklahoma City employs an expensive method called ozonation—which increases oxygen levels in water—to remove cyanotoxins from Lake Hefner water. Meanwhile, drinking water from Lake Overholser, which is also impaired, does not receive ozonation. Due to the potential public health concerns associated with the presence of cyanotoxins, it is imperative to reduce nutrient loads affecting the water quality of Lakes Hefner and Overholser. In 2012, the Oklahoma Water Resources Board (OWRB) received an EPA Urban Waters Small Grant, sub-granted by the Oklahoma Secretary of Energy and Environment, to study the causes of the eutrophic conditions in Lakes Hefner and Overholser and to evaluate which Best Management Practices (BMPs) could significantly reduce the nutrient load affecting water quality in the lakes. The study found that both non-point and point sources were contributing significantly to consistently rising levels of phosphorus and nitrogen, resulting in the eutrophic conditions found in these lakes and other waterways in Oklahoma City. The study also found that because much of the pollution was coming from urban runoff entering the North Canadian River, it is necessary to take a more holistic approach, and implement BMPs upstream as well as in the lakes themselves. Unless efforts are made to address watershed inputs, particularly nutrient loads coming from upstream sources, the potential of in-lake treatments are extremely limited—and not economically viable. In fact, despite upstream efforts by the Oklahoma Conservation Commission (OCC) to tackle non-point sources, continuing urban development upstream and around both lakes is likely increasing nutrient loads and accelerating eutrophication. Immediate and significant nutrient load reductions from both rural and urban sources are required to impact lake water quality. The Watershed Based Plan for the North Canadian River watershed, assembled by the OCC, outlines the need to document the impact of point source dischargers and recommends BMPs for non-point pollutant sources. The OWRB stresses that water quality in these lakes can only be improved if BMPs are implemented and load contributions reduced throughout the watershed. If these are implemented strategically, certain inexpensive in-lake BMPs, such as hypolimnetic withdrawal (removal of the most polluted water) during summer months, could complement these efforts. At the time the study was completed, many efforts were already underway to reduce nutrient loads at sites throughout Oklahoma. Many of these have met with measurable success. In fact, the State of Oklahoma has been nationally recognized for its collaborative, voluntary, and cost-shared work with farmers, ranchers, and landowners to reduce non-point source pollution. In 2010, Oklahoma was ranked among the top five states for reductions in phosphorus and nitrogen, and the state’s Watershed Based Plan was promoted by the EPA as a model for other states. As of 2017, Oklahoma has a total of fifty-eight success stories, documenting water quality improvements in creeks throughout the state, on the EPA Nonpoint Source Success Stories website. The Oklahoma Comprehensive Water Plan (OCWP) addresses both water quantity and quality, focusing on developing regional partnerships between water users and producers. In 2013, OWRB established the Water for 2060 Advisory Council, which aims to study and recommend “appropriate water conservation practices, incentives, and educational programs to moderate statewide water usage while preserving Oklahoma’s population growth and economic development goals.” The Council promotes BMPs within the agricultural and energy industries, encourages efficient water use, and works to engage users through incentives and education. Still, there is an immediate need for further direct monitoring efforts in Lakes Hefner and Overholser. Currently, there is no monitoring of the loads to either lake, despite the ongoing development that is likely causing an increase in eutrophication. More monitoring is needed to better understand the impacts of ongoing development projects near the lakes, as well as any positive effects caused by the successful BMPs that have been implemented in upper reaches of the North Canadian watershed. The road to water quality improvement can be a long one. Water quality testing is relatively easy. Many grants cover the entire process, including development of a Quality Assurance Project Plan (QAPP), determining testing locations, and the length of time the sites will be tested. Water quality monitoring often refers to long-term testing and reviewing results to alert authorities to changes in water quality so it is investigated and fixed. In-between the two—testing and monitoring—there is a LOT of ground to cover. Groups that do water quality monitoring and testing include watershed associations, citizen volunteers, community groups, water departments, universities and others. Some never connect to the right people to actually make sense of the data and do something to address the pollution found. In these cases, all water quality data under a QAPP should be in a database such as EPA’s STORET or a similar state-operated database. To learn about UWLN members that have built connections with their local agencies around water quality monitoring programs, check out our Impact Stories about Chattahoochee Riverkeeper and Groundwork Denver. Oklahoma Comprehensive Water Plan (OCWP). Data and Maps. The mission of the Oklahoma Water Resources Board (OWRB) is to protect and enhance the quality of life for Oklahomans by managing and improving the state’s water resources to ensure clean and reliable water supplies, a strong economy, and a safe and healthy environment.